The new breakfast bar at Chaboya! By: Sahana C. and Emily V.
Admit it, every one of us is guilty of forgetting to eat breakfast every once in a while. 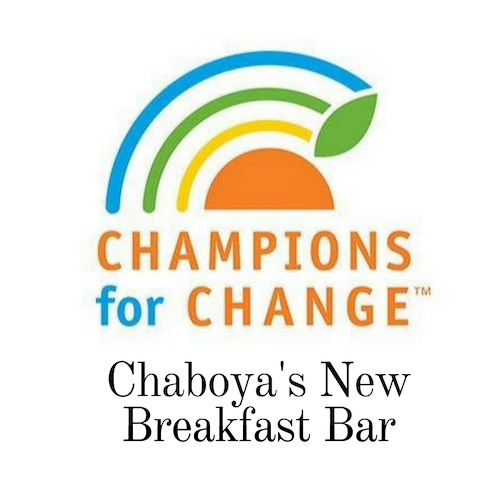 Well starve no more, because Chaboya has announced their brand new breakfast bar! You can now pick up a meal before school from 8 to 8:15 or at break. A multitude of delicious items can be purchased from the lunch line for only $2.00! Students who receive free or reduced-price lunch will also receive free or reduced-price breakfast for as low as $0.20, according to Principal Watkins. A morning meal is a great source of nutrients like calcium and iron, which helps boost energy, and ensures that important nutrients are compensated for later in the day. Utilizing this new addition to the cafeteria, students will be able to focus better in school and perform well in their classes. The variety of food items available includes mini pancakes, cinnamon toast crunch, an pan dulce, and breakfast burritos. For more information on the meal schedule, check out the breakfast menu on the school's website or refer to your school email. "The breakfast bar is great! I especially love the breakfast burritos, and everyone should try this new experience out, " says Nishanth Tharakan, a seventh grader at Chaboya. "I really like the breakfast burritos because they have so much flavor," says Rithvik Ivaturi, a seventh grader. Everyone agrees; you need to try out the buffet today!